Are you looking for a Salesforce developer for cloud-based applications or cloud-based CRM? GoodWorkLabs is a leading Salesforce development company in the Indian latitude. We offer Salesforce consulting, Salesforce development strategy, and assistance on Salesforce lightening components. With the ever-changing dynamics of the business world, you need a fresh outlook for your existing Customer Relationship Management system. With the advent of marketing cloud and cloud-based CRM, businesses have now turned into a social media driven enterprise where everyone in the chain is connected through a transparent and faster platform. All the stakeholder can participate without owning a specialized software or hardware. This flexibility has increased business efficiency and accountability. Why choose Salesforce for improving business efficiency? As an experienced Salesforce development company in India, we suggest our clients choose Salesforce for the variety of benefits it offers. The following services are what we offer in the Salesforce development. Examine and record all the current business processes. Business process mapping for implementing Salesforce functionality. At GoodWorkLabs, we provide optimized Salesforce solutions to help businesses in achieving improved productivity and enhanced profit levels. Our Salesforce consulting services include development, integration, configuration, automation, implementation, and migration. These services are further explained for your perusal. 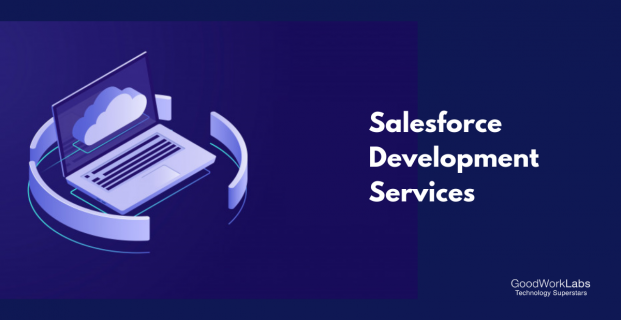 Salesforce development services include assessment of detailed client requirement, frequent feedback on functionality and the core development process. We have an experienced team of professionals who have experience in the field of Salesforce development. We have helped several businesses with our custom Salesforce development services. We offer seamless cloud integration services with an experience of Salesforce integration in ERP, Enterprise HR, Call Centre, Finance, Logistics, POS, and Legacy system. We have handled complex real-time integration at rush hour and have smoothly catalyzed the integration process. With our success rate, we are counted amongst the leading Salesforce integration service providers in India. We have a pre-defined process for Salesforce configuration as it involves optimizing Salesforce application. We vest our efforts in understanding the exact requirement of the client. This step helps us in building an app that addresses the issues in your business processes precisely. The services that we provide in Salesforce configuration are security configuration, workflows and approvals, data capture, reports and dashboards. Business process automation can save you a considerable amount of productive man-hours which are currently wasted at trivial and mundane tasks. Salesforce automation feature can help you escalate your productivity by automating contract management, order processing, inventory monitoring and control, information sharing, and most importantly customer management. Our team can assist you in utilizing this automation feature for increasing your business productivity at minimal costs. We understand your need for faster implementation for achieving an early BEP. That’s why we constantly work on the challenges associated with the implementation and assure an early fully functional implementation. For making this happen, we work on factors like user adoption, customization, integration, budget, and meeting deadlines. With our Salesforce migration services, you can easily relocate your business data. Our migration services are step bound. These services include assessment, backup of data, exporting data, a pre-test of data, migration, and validity of data. Salesforce Migration requires experts to properly migrate the data. Mere IT experts cannot complete the task with full accuracy. Also, loss of data is a major setback for any organization. We develop user-friendly tools which are compatible with multiple browsers and devices at the same time.